Strawberries are some of the fruits served to students over the summer. Did you know that that some 2,500 students in Early Education ate fresher food over the summer than in previous years? And that’s not all -- students are poised to continue munching on local, organic produce into the 2018-19 school year. Strawberries, watermelon, peaches and plums -- those are just a few of the fruits that made their way onto the plates of students this past summer, marking the first time San Francisco Unified School District (SFUSD) has purchased products directly from a local farm. SFUSD is locally sourcing more of its fresh fruit and vegetables for students in the 2018-19 school year as part of an effort to bring more sustainable sources of food into school cafeterias. The produce pilot project is meant to offer more purchasing flexibility and options for unprocessed fruits and vegetables, and allow additional opportunities for schools to use entitlement funding to both purchase locally-grown foods and continue pre-existing commercial distribution channels. This is the first year that schools in the United States have participated in the pilot program. Last spring, SFUSD named Milpitas-based Daylight Foods as its vendor for the Fresh Fruit and Vegetable Program to provide fresh fruits and vegetables to the district. 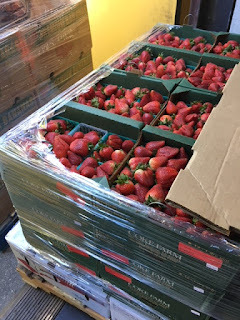 Daylight Foods works with several local farms in the greater Bay Area, meaning students are eating produce -- including strawberries, mandarins, nectarines, plums, pluots, cherry tomatoes, and sugar snap peas -- grown right here in our own backyard! - Over 2,400 lbs of local organic strawberries from Coke Farms in Hollister, Calif.
- Over 2,100 lbs of local organic watermelon from Coke Farms in Hollister, Calif.
- Over 1,600 lbs of local organic summer squash from Coke Farms in Hollister, Calif.
For more information, visit Student Nutrition Services.